Down here in the south, sweet tea is a staple. It’s priority is right up there with milk and eggs. I drink tea year-round and with every meal – including breakfast. However, I just don’t understand how people can pay for those jugs of pre-made sweet tea! Don’t y’all know how easy it is to make sweet tea? Well, I have decided to take on the responsibility of curing everyone’s tea-jug-buying habit. First of all, it is very important that you imagine me saying all this with a southern accent. M’kay? Let me break down the cost for you. Red Diamond Sweet Tea costs about $2.50 per gallon. A box of 100 Lipton Tea Bags costs about $3. If you use 4 tea bags to make a gallon of tea, that means you will make 25 gallons of tea per box of tea bags. That works out to 12¢ per gallon. A savings of $2.38 per gallon. Even if you work in the cost of sugar and a cute new tea pitcher, it is still cheaper to make your own. Now, if great savings does not sway you, what if I said homemade tea tastes better? Cause it does. And my version is The. Best. Seriously. Because I love you all dearly, I am going to share my super-top-secret Southern Sweet Tea recipe. First, bring some water to a boil. I use this handy tea kettle that I got at Ikea, but you can boil it in a saucepan or whatever you have on hand. Pour boiling water into your tea pitcher. Make sure to use a pitcher that is safe to hold hot liquids. Don’t use glass! Remove 4 small tea bags from the package and brew in the hot water. I drape the paper part over the side, but my husband likes to wrap the string around the tines of a fork, and lay the fork across the top of the pitcher. Let the tea brew for a few minutes. I don’t really time this, and I don’t really think it matters that much, but I’d guess around 5 minutes. Take out the tea bags and add cold water to fill the pitcher. You can add ice too, if you want. Add sugar. I like mine pretty sweet and use about 1 cup for for my 3 Quart Pitcher. I’d suggest adding a little, stirring, and tasting until you get it just right. Personally, I think for true, sweet tea, the sugar also needs to be brewed. I make a “sweet tea syrup” by brewing the tea, water and sugar, and THEN adding the cold water. When I make Iced Tea I use loose leaf tea that I buy in bulk. This way I can make flavored tea easily. My current favorite is a citrusy black tea. But I have also made a peachy oolong, and a caramel white tea. I fill a large teaball with about an oz. of loose tea. I place the teaball in 2 quart sauce pan and pour a quart of hot water over it. I let the tea steep for about 30 minutes. After I remove the teaball I add my sugar. I use extra fine or powderd sugar because it desolves better. I like super sweet tea so I add about 4 cups of sugar. Once I have my concentrated tea syrup I pour it into a gallon jug and add water to fill. I have never heard of adding baking soda I will have to try it. Some times I will add fruit juice to my tea to make it special. It says to use a gallon or two quart pitcher.that is a big variance. This south Ga girl thinks Luzianne Tea made with Dixie Crystal Sugar is the ONLY way to go. Best served with fried chicken, creamed sweet corn, fresh butter beans and sliced homegrown tomatoes! Hot peach cobbler for dessert!! I was starting to think I was the only one to ever use Luzianna tea! It really does make the best in my opinion. I’m from Canada too, and I wold say regular tea bags are black tea. Red Rose is black tea and you can get plain Lipton and Tetley black tea too. Earl Grey is black tea with bergamot in it (so probably not this kind). I’m definitely guessing it’s just plain old black tea. I use Red Diamond tea bags. 2 of the family size. I also use the coffee maker instead of boiling water on the stove. It is faster when you need another gallon of tea in a hurry. Place the tea bags in the carafe, and use a clean filter. Turn the coffee pot on and let the magic happen. Let the bags steep for as long as you can. I try to let the water cool to room temperature. I add about 3/4 cup of sugar to 1 gallon of tea, but that is purely up to your personal taste. No one has mentioned the way I make it, and I get raves about my tea. Boil 2-3 qts of water. Remove from heat. Place 12 reg tea bags or 4 family size in water and let steep for 20 minutes. (We prefer Luzianne, don’t like Lipton at all.) Also, add 1/4 tsp of baking soda to this, which makes for a smoother tea and prevents cloudiness later on. In 1 gallon pitcher, place about 1.75 cups of sugar (I use Splenda). Pour steeped tea over sugar and stir until sugar is dissolved. Continue to fill the pitcher by running cool water over the teabags until the pitcher is full. I am so glad that when i make Red Diamond and use 1 1/2 cups of sugar(i do have kids around so make it a bit sweeter so they will drink it) that it comes out tasting just the same or even better then the jug.I started buying Red Diamond tea jugs because it was the only tea with real sugar and no Corn Syrup,yuck! I also use Cane Sugar because that is not GMO. Sugar Beets are mostly GMO and if you buy a bag sugar and it says SUGAR it could be Sugar Beet or Cane sugar.It will probably be Sugar Beet since that is the cheaper sugar to produce. It also states on the box i just read it has a good more antioxidants then the leading brand of teas. I have taught my teen how to make the tea and it saves her 3 dollars a day she was spending buying the tea jugs. I use 5 family size bags or one of Lipton’s gallon size bags for a gallon of tea. Tea should never be brewed for more than 2 minutes. After that, it will emit a bitter taste. I brew mine for two minutes, and then douse the bags in the water 30 times to get the rich tea flavor without the bitterness. I find that by putting the sugar (or in our case, Truvia) in the boiling water, it not only breaks the sugar down so it isn’t grainy but it also makes the sugar stronger allowing me to use less for the same sweetness. I highly recommend it. We only ever used Red Diamond tea bags, 3 qt sized bags for a gallon. I always either combine the water, sugar and tea bags and bring to a slow boil, turn off the heat and stir. Let tea seep for just a few minutes depending on how dark you like it. Pour into a pitcher, add cold water to top off. If I find myself having to use a tea kettle, I put the sugar in the pitcher with just enough hot water to dissolve it, let it sit for a few while the water comes to a boil, add to sugar water, add tea bags and steep. 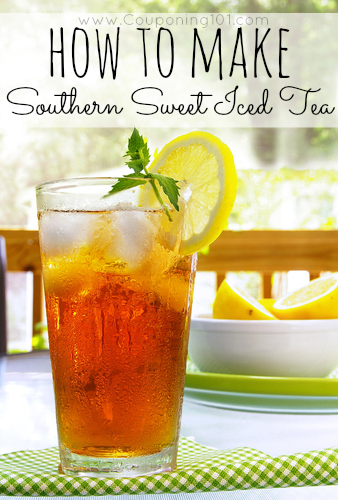 For me adding the sugar while the tea is still hot is what makes it “southern” sweet tea. just opened a new order from red diamond. 4 boxes of gallon size tea bags. 12 to a box. real cheap. real good tasting iced tea. I’m with you on saving and making the tea at home, but my personal preference is Tetley. I think I got my sweet tea tooth (teeth?) from my neighbor “Granny.” I always wonder where she grew up, because we were way up in the Rocky Mountains and anything but Southern, hehe. 🙂 She never shared her recipe with us, nor would she let any of us kids help her make more when we used up her iced tea. I haven’t found anything quite like it since then. My mom has a BIG old microwave that she can actually fit half-gallon glass bottles into standing up. She microwaves 4 tea bags in a 1/2 gallon glass jar for 2 minutes, then lets it stand untouched until it’s cool enough to handle. Then she adds 3/4 C of sugar and 1 oz lemon juice. The reason everyone has better luck pouring the boiling hot water on the sugar is that the sugar dissolves better in hot water than in cooler water. I don’t know how steeping the tea bags in sugar water might affect the flavor though. I make mine similarly however I use 6 or 7 tea bags and VERY important. I add my sugar to the pitcher and pour the hot water over the sugar so that it dissolves completely. I then tie the tea bags together after removing the little paper tags and let them steep for a bit. THEN add the cold water to the top of the pitcher (this is for 2 quarts). YUM, YUM!!!! @kim, Okay, I might have to try adding the sugar first since a lot of people are saying they do it that way. Wondering if it makes a difference…. Okay, you rule! I live in FL and my family loves our sweet tea. I don’t make it often because I always thought you had to have hot water for the entire pitcher. So I’d boil water in my tea kettle, pour that into the pitcher and steep the bags in there while I boiled ANOTHER kettle of water to top it off. I NEVER thought to top it off with cold water. What a light bulb moment! Thank you soooo much. i will boil my water and get my teabags ready… then i’ll microwave about 2 cups of water till boiling, then add 2-2 1/2 cups of sugar to make a syrup, then after i put in my teabags, let steep for about 5 mins. then i’ll add my sugar water, and let sit for about 15-20 mins… i make almost 2 gallons with this. @Shelly G., Yeah, I have worked my way down to 1 cup of sugar too! Been slowly lowering it by the tablespoon for years! It used to be VERY sweet! Thanks for sharing your recipe. I’m not Southern, but I sure love sweet tea! Can’t wait to try it out! Southern sweet tea is the best, but Lipton is TERRIBLE tea. It has a bitter bite that just makes it AWFUL. The only tea that will EVER darken our door or fill my pitcher is Tetley Tea. It has a wonderful full flavor and an almost velvety mouth feel. It also has a smooth finish (after taste) and isn’t bitter at all. We use 6 family size bags and 2 cups of sugar per gallon. I learned how to make tea while working at Chick-fil-A, and if you love the tea there you will love this recipe. @Adam, Oh, I like Chick-fil-A tea! I have never tried Tetley, I may check it out. I have always been a Lipton fan though, so I may already be set in my ways, lol! Thanks for your recipe! It is amazing how people will buy such simple things ready made… My recipe is a drop different, I use lemon in mine and I make mine into a concentrate because we go through iced tea quickly! I’m here from frugal friday and always am glad to find other frugal blogs! I make mine similar to Sharon but I only use 8 tea bags. I use a large sauce pan and let the water boil. Then I had the tea bags and let it boil a little more. After that, I let it sit for about 10 minutes and then I pour it on top of the sugar which is already placed in the pitcher. I must like stronger tasting tea than ya’ll. I use 10 regular tea bags, or 4 family size tea bags for a gallon of tea. I also put my tea bags in the water and let it boil in the water for about 5 minutes. I put a little water in my jug and then add 1 & 1/2 cups of sugar then add the hot tea, I pour the cooked tea into the jug and then keep adding water into the pot with the tea bags until the water is clear. I keep my tea in a jug with a lid, it keeps longer in the frig. @Lynn Greene, I love how everyone makes their tea differently. And we are all set in our ways and think ours is the best! lol!